Basic Formatting should not cause any problems as it is identical to formatting in a Word document. If you hover over each icon it will show a tooltip explaining what each button does. 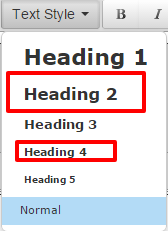 This dropdown menu should be used to keep formatting consistient throughout the website. For example, if you ant to creating a sub heading in a page simply type the text, highlight it and select Heading 3 - the text will always look the same. It has implications for search as well. Heading 1 should only be used for the welcome message title on teh home page. Everything else (ideally) should be heading 2 or 3 (they are the most popular). Use the button depicted below to create a a line across the page. Using a long string of hyphens (-) or underscores (_) can cause problems with formatting. If you experience problems with the formatting or the text is not "behaving" in an expected fashion then you will have either pasted content from another website or from Microsoft Word. When you do this the superfluous formatting is pasted as well - and this is what causes the problems. To fix it, simply press teh WORD CLEANER icon depicted below. This will remove the problematic formatting and every should work as expected.